Hyundai Forums : Hyundai Forum > Hyundai Models > Elantra & Lantra Forums (Please Post In The Correct Sub Forum For The Year Of Your Vehicle) > MD ( 2011-2016) Elantra sedan/coupe > **1.8 nu engine rattle fix** pics!! **1.8 nu engine rattle fix** pics!! Hello everyone! 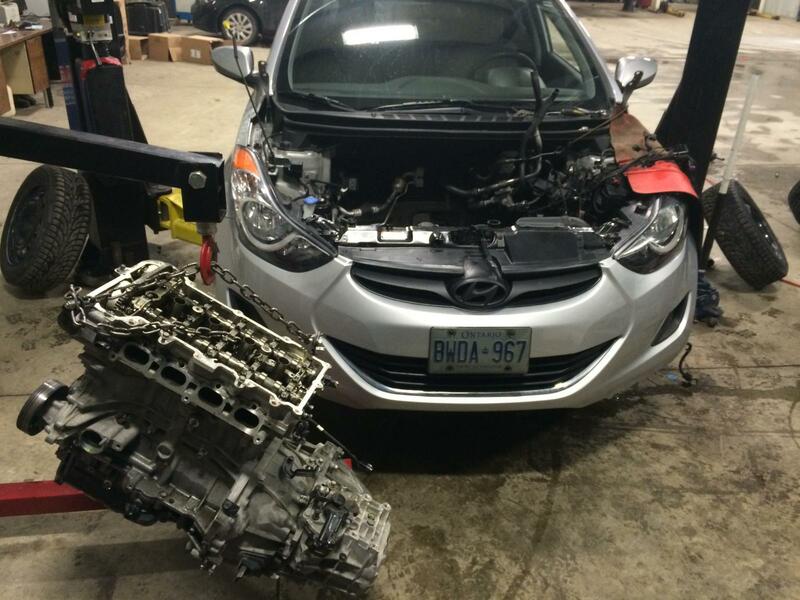 Just sharing some pics of my 2012 Elantra GL with the 1.8 nu engine, I work at a Hyundai dealer and one day I was looking at the tsb's and Hyundai finally recognized there was a problem with the block of some 1.8 engines and was ok'd to replace the block in my car because it was rattling. What is the issue/cause of the rattling? TSB number please or post a copy for us to see. My buddy just had short block replaced in warranty ;bad piston slap I think. Well my 1.8L isn't rattling so apparently the engine is bolted in tightly. The OP likely meant to say that they're replacing the short block...the lower engine including all internal parts. Bad rings? Easier to drop out buttom as a whole ... then take apart. Il post a copy of the tsb when I get to work, the tab says that the problem is with the coating on the pistons and conecting rods.....but at our dealer just replacing the short block has never fixed the problem we have had to also replace the head, cams, lifters, cam holders..... Everything, in the end I would be cheaper and easier to replace the long block ( entire motor) but Hyundai Canada is a bunch of idiots and won't let us do it. sbr711 and a.kreation like this. Mine makes some noise on start up, but goes away once it warms up. Did your car do the same or did it continue even when warmed up?